THERESA MAY is expected to tell MPs she wants the EU to back down on the controversial Northern Ireland backstop when she outlines her Brexit Plan B today. The prime minister has been forced back to the Commons six days after MPs condemned her Brexit deal to the heaviest defeat in modern history. In a Cabinet conference call last night, Mrs May reportedly said she wanted to appeal first to rebel Tory Brexiteers and her allies in the DUP rather than concede to Labour’s demand for a permanent customs union. 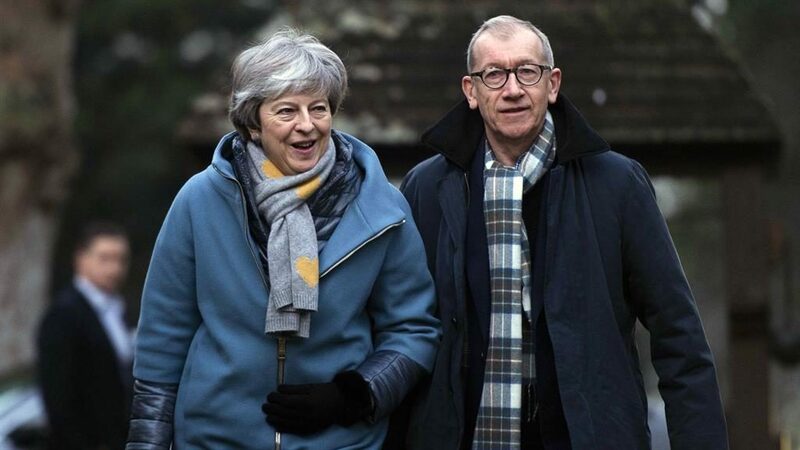 She told them her plan was to do ‘something’ about the backstop, but there was no suggestion how she intends to win over EU members after one suggestion for a bilateral deal between the UK and Ireland was dismissed as a non-starter by the Republic. One cabinet source told reporters that meant ‘anything’, rather than something specific. Meanwhile, she was urged by former Labour minister Caroline Flint to take both ‘Remain’ and ‘no-deal’ off the table to break the Brexit deadlock. Ruling out the ‘hardline’ options so that MPs can find a deal most acceptable to parliament, while also respecting the result of the referendum vote, is the only way to break the impasse, Ms Flint said. It comes with just ten weeks to go until Britain’s scheduled exit on March 29 but with no prospect of a deal following the overwhelming rejection of Mrs May’s draft agreement by MPs. Labour is today set to accuse the government of wasting taxpayers’ cash on preparations for a no-deal exit. Leader Jeremy Corbyn said the chancellor had earmarked £4.2billion and already spent £1.9billion — enough to pay the annual salaries of 50,000 extra police officers. At least two cross-party groups of MPs are planning measures to delay or frustrate Mrs May’s plans. One group, including senior Labour MP Yvette Cooper and Tory Nick Boles, is backing a bill to suspend Brexit if there is no new deal with Brussels by the end of February. A second, led by former attorney general Dominic Grieve, has tabled an amendment to enable backbenchers to choose to debate and vote on Brexit issues, one day a week. Downing Street, which has denied no-deal preparations are a stunt and insists it is carrying out sensible precautions, said it would be ‘extremely concerning’ if attempts were made to ‘remove the government’s power to meet the legal conditions of an orderly exit’. Labour’s Hilary Benn, appearing on the Andrew Marr Show with Tory rebel Anna Soubry, said: ‘MPs doing their job are not plotters.’ Meanwhile former Brexit secretary Dominic Raab told Sky News he believed the UK could cope with a no-deal exit.